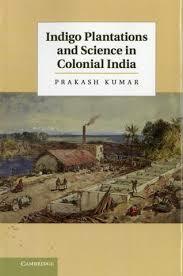 Indigo Plantations and Science in Colonial India by Prakash Kumar (New Delhi: Cambridge University Press), 2013; pp 334, Rs 995. A review by John Mathew for The Economic and Political Weekly.Follow the link below to the original report, which you can download as a pdf from the site. An intriguing and detailed story awaits the reader in Prakash Kumar’s Indigo Plantations and Science in Colonial India. As a narrative, the major thread to follow is that the production of indigo, Indigoferum tinctorium (today Indigofera tinctoria), in colonial Bengal (the predominant locus of discussion) is not to be considered as either derived solely from earlier practices in the country, be they from the west, north or south of the country, or as an experimental transplant from the West Indies, but as the result of complex interactions between colonial policies (including imitation with inflection among European potentates) and local practice. From the 17th to the 20th centuries indigo was a fugitive among industries, wandering from Gujarat in western India to the West Indies and then back to Bengal in eastern India (p 4, repeated on p 56). The author uses an important tract by the French Dominican preacher and writer, Jean Baptiste Labat as a significant point of entry into the cultivation of Caribbean indigo plantations in Martinique in 1722 (duly taken up by Phillip Miller’s Gardener’s Dictionary in 1731, and thereby, rendered in English) to find resonance in practice in Bengal. The development of synthetic indigo would sound the death knell for the natural product in 1897, even if it was maintained for another couple of decades through the implacable effortsof planters and the exigencies of the first world war. Kumar’s effort provides a significant and laudable addition to the literature of what was one of the most important agricultural crops incolonial India. The narrative takes the following lineaments across six chapters. In the first, “The World of Indigo Plantations”,the connection between the Caribbean (extended to South Carolina in theUnited States) and India is made explicit for the crop. This is done in ways that are redolent (if not necessarily symmetrical) of efforts by Richard Grove for physiocratic improvement of plants taken from French efforts in the botanical garden at Pamplemousses in Mauritius and brought to Bengal (particularly through the efforts of Robert Kyd in founding the Calcutta Botanical Garden in 1787) in Green Imperialism:Colonial Expansion, Tropical Island Edens and the Origins of Environmentalism, 1600-1860 (1995). This is also similar to comparisons of medical practices linking the colonial and the local in Pratik Chakrabarti’s Materials and Medicine: Trade, Conquest and Therapeutics in the Eighteenth Century (2011) in both Jamaica and India. In the latter, however, the vector is not from one region to the other, but both are directed towards the metropole that is London. We are also introduced to the role of particular workers. A tract called The Complete Indigo-Maker (1769) by Elias Monnereau in San Domingue (Haiti) published in England has considerable influence on James Prinsep and Claude Martin, both major indigo manufacturers (among other exploits) in India.A local alternative from the genus Nerium is championed on the other handby the superintendent of the Calcutta Botanical Garden, William Roxburgh who affords the allegedly new species the specific epithet tinctorium (mirroring that for Indigo, p 69). Chapter 2, “The Course of Colonial Modernity: Negotiating the Landscape in Bengal” is partially devoted to the history of agriculture in Colonial Bengal, where the role of peasant-cultivated plots is brought to the fore in Bengal and Tirhut in Bihar with detailed discussions of consequent indigo practice and culture. The chapter does, however, take tangential if fascinating turns from its original ambit with discussions of the rise of organic chemistry in France, particularly at Paris’s Museum d’Histoire Naturelle and its application through the work of Michel Eugene Chevreul. The latter was a student of Louis-Nicolas Vauquelin, himself an acolyte of the renowned if unfortunate Antoine Lavoisier (a victim of the guillotine during the Terror). Equal attention is paid to developments in agriculture in Germany, largely credited to the doyen of organic chemistry there, Justus von Liebig. His ideas are adopted by the “cosmopolite”, Eugene Schrottky of Dresden, who in 1876, published The Principles of Rational Agriculture Applied to India and ItsStaple Products. This book, in essence, advocates the replenishment of a depleted topsoil, even as its author takes an exception to the effort of nationalists focusing on the drain of wealth from the colony, suggesting that the emphasis should be on the improvement of agriculture locally instead. Approximately a decade later, a rapprochement between practice and the “new chemistry” is sought by the British chemist John Augustus Voelcker, in proposing the protection of nitrogen in the soil. “Colony and the External Arena: Seeking Validation in the Market” is the title and focus of the third chapter, where the optimisation of the production of agricultural indigo is pitted against the arrival of an upstart, synthetic indigo, emergent from Germany. With the discovery of aniline, an alkaline oil in coal tar similar to that in indigo by a German student of Liebig, though based in London, August Wilhelm Hofmann in 1843, research in subsequent decades unveiled a host of aniline colours beginning with mauve (1856), aniline red (1859) and violet and black (both in 1863). Snatching back the initiative, the German team of Carl Graebe and Carl Liebermann in 1869 invents alizarin, a red colour thereunto derived from the plant madder. Synthesis of alizarin on an industrial scale was taken up by the company Badische Anilin and Soda Fabrik (BASF), ushering in a dominant position for Germany in the field. One of the key points of Kumar’s thesis resides here – that the threat to indigo emerges from outside the colonial sphere inasmuch as its centre is in Germany. By the end of the 19th century, it is onlyindigo that stands, like the MoorishAlhambra, holding out against the incursions of the synthetic form’s inexorable advance. The repercussions are massive, including efforts to reinvigorate planting techniques, diversify crops throughrotation with sugar and rhea and introduce new varieties of indigo. The fourth chapter, “Local Science: Agricultural Institutions in the Age of Nationalism”, takes for its remit thedevelopment of laboratory techniques for the improvement of indigo production. The underlying rationale is that natural indigo will dye longer and more deeply than any synthetic competitor. To this end, planters rally behind new agricultural stations at Dalingserai (founded at the behest of the IndigoImprovement Syndicate – IIS), Peeprah (a brainchild of the Bihar Indigo Planters’ Association – BIPA) and Pusa (formed after the amalgamation of BIPA and IIS in 1901), adducing evidence for government support for agriculture in both the United States of America and in Dutch Java, despite evidence that syntheticindigo was seen to be far cheaper. If anything, the role of Mendelian genetics and selection, consequent to its independent rediscovery in 1900 a feature of Chapter 5, “The Last Stand in Science and Rationalization”, redoubles efforts to maximise yield in the field, particularly with improvement through biological selection. An irony resides in the factthat two men who ostensibly shouldbe working in tandem (and even make initial overtures in this regard), William Bloxham, a chemist at Dalingserai who returns to London to continue research in optimising the yield of colour and Cyril Bergtheil, a colonial bacteriologist seconded to studying indigo at the laboratory at Sirsiah, develop a strong personal rivalry that will map on to considerations between metropole and periphery. Bloxham’s emphasis is on the estimation of colour, Bergtheil’s more on the cultivation and manufacturing. Nonetheless the latter is also concerned with the “colour-question” and resents Bloxham’s appropriation of credit and priority on the subject. The matter of percentages of colour, however, has exceeded the patience of planters themselves, where the emphasis of difference is clearly somewhere else. An apposite quotation reflects the temper. There is no such thing as artificial indigo. What’s meant is synthetic indigotin produced from the derivatives of coal tar, a very different thing. Natural indigo is an organic compound body which contains several other ingredients and colours besides indigotin, and it is the combination of these that gives natural indigo preeminence over all other blue colours. One might as well call albumen an egg or starch a potato as to call synthetic indigotin indigo (quoted on pp 239-40). The planters’ objections notwithstanding, the writing is on the wall and even the likes of Bergtheil are wise to it. The introduction of a new strain from Java, which promises and initially delivers better yield, will suffer from the effects of wilt to which there appears no swift anodyne. Things look decidedly bleak by the summer of the 1913, when the Sirsiah laboratory is closed. Ironically, a new lease of life for the beleaguered natural form will be vouchsafed from the unlikeliest of sources – a world war. The outbreak of hostilities (underlying Chapter 6, “A Lasting Definition of Improvement in the Era of World War”) among western powers has grave implications for the dissemination of synthetic indigo from Germany. Attenuation in supply generates a renewed demand for natural indigo. At the same time, indigo from Zululand appears to hold promise against wilt and is promptly imported to India. Besides, seeing as the Indian troops have stayed loyal to Britain, it stands to reason that the empire should stand with its jewel in the crown and support its interests, which in turn buttress those of the empire. Experiments continue at full swing. A new indigo research chemist, W A Davis, is despatched to Pusa, where indigo paste making is undertaken in full swing. With developments in paste production and efforts made to resist wilt, it appears as though indigo will have a fighting chance. Yet the cessation of hostilities in 1918, coupled with horrendous climatic conditions that result in poor yield that force indigo prices up, put paid to this short-term resurgence. Practicalities of trade prospects (including poaching German technology) as well as annoyance with continuing labour insurgency in Bihar, ultimately force the British government’s hand and natural indigo as a significant agricultural crop for the region is put to pasture. As the foregoing discussion suggests, we have a rich and cogent description of the story of indigo in north-eastern India, in particular Bengal and Bihar. Yet, there is an impulse early in the book that points to a tension. Kumar writes that “the study of science in south Asian historiography has so far evolved along two parallel tracks – works that cover colonial science and works that cover the social history in colonial south Asia” (p 9). He contends that the south Asian historians studying science tend to fall into one camp or the other. Clearly his own effort seeks a reconciliation between these groups and the aim is immediately to be congratulated. As to whether he succeeds is perhaps more open to question. The historiography of the social milieu in which agriculture develops in the country, not least for indigo (though a comparison with other crops in the region under question, even if briefly would have been welcome), is extensive. Rather than pay it cursory heed, it might have been worthwhile acknowledging the vast bibliography. We learn little of the restiveness of agriculturists in Bengal that occasions the move to Bihar (only passing reference, for instance, is made to Dinabandhu Mitra’s seminal play of the mid-19th century, Nil Darpan (The Indigo Revolt), which deals with the plight of peasant indigo farmers in Bengal), save for throwaway sections. There is also significant repetition of ideas, sometimes of entire quotations, suggesting that the editor’s pen was not perhaps as insistent as it might have been. These shortcomings apart, Indigo Plantations and Science in Colonial India is a work of painstaking, comprehensive research and adds incalculably to our knowledge of the crop in its local and global spheres as well as its deployment as an object and subject both of circulation and of conflict. be shifting heads and also orifice wallets for the entire energy tooling community.